What’s spring without a little bit of startitis? Inspired by the recent crocus in the backyard, the (sometimes) sunny and warmer (well, it’s getting there) weather, and an accidental discovery of the yarn hiding in my knitting bag, I cast on last night for Crocus Pocus. 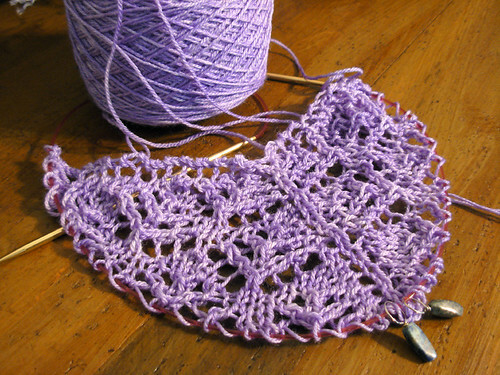 The yarn is Knitting Notions Classic Merino Bamboo, colorway Lilac, which was actually purchased quite a while back to make this little shawl. So far, so good, and very fun! That’s a perfect color for spring. Thank you for visiting my blog. I’m glad to have discovered yours!